Custom kitchen and bath cabinets have been our mainstay product over the years. As you can see, the quality is of the highest order! You may click any image to enlarge it; click a second time to close the larger image. We have had the oportunity to create some magnificant pieces! Handmade doors add that special touch of luxury at an affordable price! We sometimes receive unique and special designs requests, and as you can see, nothing is too large or small for us. 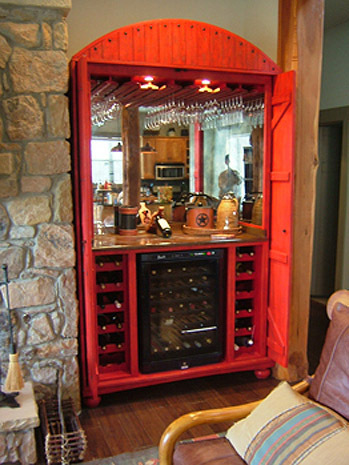 "We wanted a cabinet that would look perfect in our rustic vacation home and be a functional wine storage and bar area. We had the perfect space picked out for it to be installed, the wine cave purchased and a detailed idea for wine glass storage. We thought we would find the perfect antique armoire that could be retrofitted for our purposes. After months of looking, it became apparent that we would have to have this custom-made. Bruce Tabor was one of several people who were recommended and after meeting with him we realized that we had no idea what the design should be, but Bruce would work with us and create the cabinet that is the focal point of our entertainment area. Bruce was honest, patient, enthusiastic, creative and skillful. His goal was to please us and he built a piece of furniture that is a work of art. He was a delight to work with and we would use him again if the need arose. I highly recommend this personable craftsman." Bruce Tabor is an innovative wood craftsman beyond description. 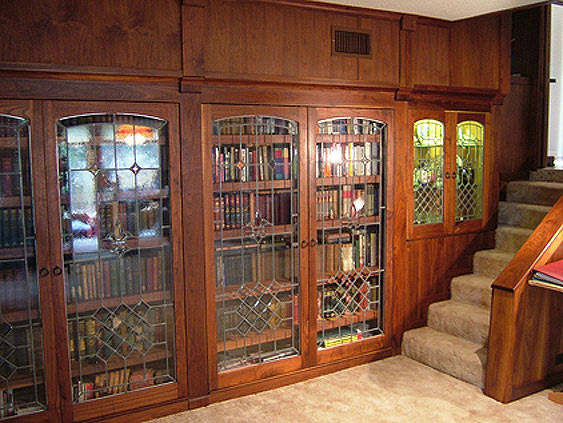 I have known Bruce for over 20 years and during that time he has completely remodeled my home as well as crafted an incredibly beautiful library shelving system with leaded glass doors. He designed and built two leaded glass doors that serve as the entry to my home and the entry to our library. He has done numerous very creative small wood working jobs for us such as a beautifully personalized toy chest for our grandson which includes a hydraulic hinge system to keep the door from falling on our grandson as he digs through his toys. The toy chest has multiple separators such that the toys can be segregated in any manner desired. If you want quality and creative wood craftsmanship, I would recommend Bruce Tabor over all individuals I know.